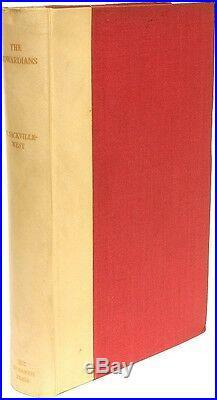 London: by Leonard & Virginia Woolf The Hogarth Press, 1930. Limited to 125 numbered and signed copies this being copy #55 signed by Sackville-West in purple ink. Bound in the publisher's original vellum backed red cloth boards, gilt lettered spine, top edge gilt, others uncut, vellum clean and bright, lower back corners lightly bumped otherwise A SHARP FINE COPY. Woolmer 235a Based on her own privileged upbringing. Who we are - D&D Galleries was founded in 1985. We are members of the Antiquarian Booksellers Association of America (ABAA), the International League of Antiquarian Booksellers (ILAB), and the Provincial Bookfair Association of Great Britain (PBFA). Our inventory (largely English language only) is slightly eclectic and ranges from the 16th through the 20th centuries with sub-specialties in S. And Wing books, Lewis Carroll, Charles Dickens, presentation and association material as well as 17th and 18th C. British history, sets and bindings. The item "Vita SACKVILLE-WEST The Edwardians FIRST EDITION LIMITED SIGNED" is in sale since Friday, March 3, 2017. This item is in the category "Books\Antiquarian & Collectible". The seller is "dnd-galleries" and is located in Somerville, New Jersey. This item can be shipped worldwide.